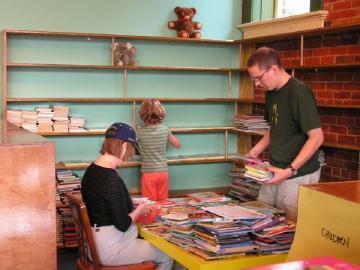 My daughter, my mother, and I sorting books for the kids section at Better World Books first Goshen location. On Tuesday, March 12th 2019, during our commute home, I learned from a carpool buddy that Better World Books was closing its Goshen Indiana retail spot. The news stunned me and my local community. Eleven years ago my children, my mother, and I were one of several volunteers helping get the store ready; Everyone chipping in some labour to help nurture a much needed bookstore. Locally, Better World Books served the community not only by selling used and new books but by offering special activities such as board game nights, youth activities, and artistry and music during First Fridays celebrations. Better World Books is thankful to have been part of the Goshen community for the past ten years. After careful consideration, we have made the difficult decision to close our sole retail location on or before March 30, 2019 in order to focus on serving our customers via our growing e-commerce business. We sincerely appreciate our devoted fans and customers who love to shop at our Goshen location for their local book purchases. While our store is closing, BWB continues to grow, and we are reinvesting in the customer experience at www.betterworldbooks.com, where you will find a great selection of over 8 million new and used books and great prices (with fast, free shipping) on all of your orders. Best of all, your purchases will continue to support literacy, libraries and educational causes locally and around the world. Thank you for your loyalty to Better World Books, and please join us this Saturday from noon to 6pm for the first of a series of Clearance Sales, where you will find store-wide bargains on all inventory in the store (while supplies last). I love the bookstore experience. On vacations, we make it a matter of practice to visit local bookstores. A local bookstore represents the soul of the community in which it resides. The books that are shelved reflect the kinds of books that the community buys and trades amongst themselves. We had a good run and I am thankful for what my community had. Better World Books Closing Goshen Store by Jeremy Friesen is licensed under a Creative Commons Attribution-NonCommercial-NoDerivatives 4.0 International License. Based on a work at https://takeonrules.com/2019/03/17/better-world-books-closing-goshen-store/. Permissions beyond the scope of this license may be available at https://takeonrules.com/more_permissions/.